Tbx5 is a gene that is located on the long arm of chromosome 12. 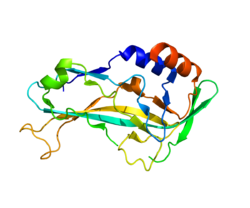 Tbx5 produces a protein called T-box 5 that acts as a transcription factor. The Tbx5 gene is involved with forelimb and heart development. This gene impacts the early development of the forelimb by triggering fibroblast growth factor, FGF10. Tbx5 is involved with the development of the four chambers in the heart, the electrical conducting system, and the septum separating the right and left sides of the heart. In studies done in mutant mice without the TBX5 gene it has been shown that the homozygous mice did not survive gestation due to the heart not developing past embryonic day E9.5. Also the heterozygous mice were born with morphological problems such as enlarged hearts, atrial and ventral septum defects, and limb malformations similar to those found in the Holt-Oram Syndrome. Supporting the essential role of TBX5 in the heart development. The encoded protein plays a major role in limb development, specifically during limb bud initiation. For instance, in chickens Tbx5 specifies forelimb status. The activation of Tbx5 and other T-box proteins by Hox genes activates signaling cascades that involve the Wnt signaling pathway and FGF signals in limb buds. Ultimately, Tbx5 leads to the development of apical ectodermal ridge (AER) and zone of polarizing activity (ZPA) signaling centers in the developing limb bud, which specify the orientation growth of the developing limb. Together with Tbx4, Tbx5 plays a role in patterning the soft tissues (muscles and tendons) of the musculoskeletal system. A mutation in this gene can cause Holt-Oram syndrome or Amelia syndrome. Holt-Oram syndrome can cause several different defects. One effect of Holt-Oram syndrome is a hole in the septum. Another symptom of this syndrome is bone abnormalities in the fingers, wrists, or arms. An additional defect that Holt-Oram syndrome can cause is a conduction disease leading to abnormal heart rates and arrhythmias. Amelia syndrome is a condition where forelimb malformation occurs because FGF-10 is not triggered due to Tbx5 mutations. This condition can lead to the absence of one or both forelimbs. ^ Basson CT, Bachinsky DR, Lin RC, Levi T, Elkins JA, Soults J, Grayzel D, Kroumpouzou E, Traill TA, Leblanc-Straceski J, Renault B, Kucherlapati R, Seidman JG, Seidman CE (January 1997). "Mutations in human TBX5 [corrected] cause limb and cardiac malformation in Holt-Oram syndrome". Nature Genetics. 15 (1): 30–5. doi:10.1038/ng0197-30. PMID 8988165. ^ Terrett JA, Newbury-Ecob R, Cross GS, Fenton I, Raeburn JA, Young ID, Brook JD (April 1994). "Holt-Oram syndrome is a genetically heterogeneous disease with one locus mapping to human chromosome 12q". Nature Genetics. 6 (4): 401–4. doi:10.1038/ng0494-401. PMID 8054982. ^ Patel C, Silcock L, McMullan D, Brueton L, Cox H (August 2012). "TBX5 intragenic duplication: a family with an atypical Holt-Oram syndrome phenotype". European Journal of Human Genetics. 20 (8): 863–9. doi:10.1038/ejhg.2012.16. PMC 3400730. PMID 22333898. ^ Jhang WK, Lee BH, Kim GH, Lee JO, Yoo HW (August 2015). "Clinical and molecular characterisation of Holt-Oram syndrome focusing on cardiac manifestations". Cardiology in the Young. 25 (6): 1093–8. doi:10.1017/s1047951114001656. PMID 25216260. ^ a b c Steimle JD, Moskowitz IP (2017). "TBX5: A Key Regulator of Heart Development". Current Topics in Developmental Biology. 122: 195–221. doi:10.1016/bs.ctdb.2016.08.008. PMC 5371404. PMID 28057264. ^ Nishimoto S, Wilde SM, Wood S, Logan MP (August 2015). "RA Acts in a Coherent Feed-Forward Mechanism with Tbx5 to Control Limb Bud Induction and Initiation". Cell Reports. 12 (5): 879–91. doi:10.1016/j.celrep.2015.06.068. PMC 4553633. PMID 26212321. ^ Boogerd, Cornelis J.; Evans, Sylvia M. (8 February 2016). "TBX5 and NuRD Divide the Heart". Developmental cell. 36 (3): 242–244. doi:10.1016/j.devcel.2016.01.015. ISSN 1534-5807. PMC 5542051. PMID 26859347. ^ Virdis G, Dessole M, Dessole S, Ambrosini G, Cosmi E, Cherchil PL, Capobianco G (2016). "Holt Oram syndrome: a case report and review of the literature". Clinical and Experimental Obstetrics & Gynecology. 43 (1): 137–9. PMID 27048037. ^ Packham EA, Brook JD (April 2003). "T-box genes in human disorders". Human Molecular Genetics. 12 Spec No 1 (Spec No 1): R37–44. doi:10.1093/hmg/ddg077. PMID 12668595. ^ Takeuchi JK, Ohgi M, Koshiba-Takeuchi K, Shiratori H, Sakaki I, Ogura K, Saijoh Y, Ogura T (December 2003). "Tbx5 specifies the left/right ventricles and ventricular septum position during cardiogenesis". Development. 130 (24): 5953–64. doi:10.1242/dev.00797. PMID 14573514. ^ a b c Tickle C (October 2015). "How the embryo makes a limb: determination, polarity and identity". Journal of Anatomy. 227 (4): 418–30. doi:10.1111/joa.12361. PMC 4580101. PMID 26249743. ^ Rodriguez-Esteban C, Tsukui T, Yonei S, Magallon J, Tamura K, Izpisua Belmonte JC (April 1999). "The T-box genes Tbx4 and Tbx5 regulate limb outgrowth and identity". Nature. 398 (6730): 814–8. doi:10.1038/19769. PMID 10235264. ^ Hasson P, DeLaurier A, Bennett M, Grigorieva E, Naiche LA, Papaioannou VE, Mohun TJ, Logan MP (January 2010). "Tbx4 and tbx5 acting in connective tissue are required for limb muscle and tendon patterning". Developmental Cell. 18 (1): 148–56. doi:10.1016/j.devcel.2009.11.013. PMC 3034643. PMID 20152185. ^ Pizard A, Burgon PG, Paul DL, Bruneau BG, Seidman CE, Seidman JG (June 2005). "Connexin 40, a target of transcription factor Tbx5, patterns wrist, digits, and sternum". Molecular and Cellular Biology. 25 (12): 5073–83. doi:10.1128/mcb.25.12.5073-5083.2005. PMC 1140596. PMID 15923624. ^ a b Garg V, Kathiriya IS, Barnes R, Schluterman MK, King IN, Butler CA, Rothrock CR, Eapen RS, Hirayama-Yamada K, Joo K, Matsuoka R, Cohen JC, Srivastava D (July 2003). "GATA4 mutations cause human congenital heart defects and reveal an interaction with TBX5". Nature. 424 (6947): 443–7. doi:10.1038/nature01827. PMID 12845333. ^ Hiroi Y, Kudoh S, Monzen K, Ikeda Y, Yazaki Y, Nagai R, Komuro I (July 2001). "Tbx5 associates with Nkx2-5 and synergistically promotes cardiomyocyte differentiation". Nature Genetics. 28 (3): 276–80. doi:10.1038/90123. PMID 11431700. Simon H (April 1999). "T-box genes and the formation of vertebrate forelimb- and hindlimb specific pattern". Cell and Tissue Research. 296 (1): 57–66. doi:10.1007/s004410051266. PMID 10199965. Packham EA, Brook JD (April 2003). "T-box genes in human disorders". Human Molecular Genetics. 12 Spec No 1 (Spec No 1): R37–44. doi:10.1093/hmg/ddg077. PMID 12668595. Li QY, Newbury-Ecob RA, Terrett JA, Wilson DI, Curtis AR, Yi CH, Gebuhr T, Bullen PJ, Robson SC, Strachan T, Bonnet D, Lyonnet S, Young ID, Raeburn JA, Buckler AJ, Law DJ, Brook JD (January 1997). "Holt-Oram syndrome is caused by mutations in TBX5, a member of the Brachyury (T) gene family". Nature Genetics. 15 (1): 21–9. doi:10.1038/ng0197-21. PMID 8988164. Basson CT, Huang T, Lin RC, Bachinsky DR, Weremowicz S, Vaglio A, Bruzzone R, Quadrelli R, Lerone M, Romeo G, Silengo M, Pereira A, Krieger J, Mesquita SF, Kamisago M, Morton CC, Pierpont ME, Müller CW, Seidman JG, Seidman CE (March 1999). "Different TBX5 interactions in heart and limb defined by Holt-Oram syndrome mutations". Proceedings of the National Academy of Sciences of the United States of America. 96 (6): 2919–24. doi:10.1073/pnas.96.6.2919. PMC 15870. PMID 10077612. Yang J, Hu D, Xia J, Yang Y, Ying B, Hu J, Zhou X (June 2000). "Three novel TBX5 mutations in Chinese patients with Holt-Oram syndrome". American Journal of Medical Genetics. 92 (4): 237–40. doi:10.1002/(SICI)1096-8628(20000605)92:4<237::AID-AJMG2>3.0.CO;2-G. PMID 10842287. Hatcher CJ, Goldstein MM, Mah CS, Delia CS, Basson CT (September 2000). "Identification and localization of TBX5 transcription factor during human cardiac morphogenesis". Developmental Dynamics. 219 (1): 90–5. doi:10.1002/1097-0177(200009)219:1<90::AID-DVDY1033>3.0.CO;2-L. PMID 10974675. Hatcher CJ, Kim MS, Mah CS, Goldstein MM, Wong B, Mikawa T, Basson CT (February 2001). "TBX5 transcription factor regulates cell proliferation during cardiogenesis". Developmental Biology. 230 (2): 177–88. doi:10.1006/dbio.2000.0134. PMID 11161571. Cross SJ, Ching YH, Li QY, Armstrong-Buisseret L, Spranger S, Lyonnet S, Bonnet D, Penttinen M, Jonveaux P, Leheup B, Mortier G, Van Ravenswaaij C, Gardiner CA (October 2000). "The mutation spectrum in Holt-Oram syndrome". Journal of Medical Genetics. 37 (10): 785–7. doi:10.1136/jmg.37.10.785. PMC 1757164. PMID 11183182. Hiroi Y, Kudoh S, Monzen K, Ikeda Y, Yazaki Y, Nagai R, Komuro I (July 2001). "Tbx5 associates with Nkx2-5 and synergistically promotes cardiomyocyte differentiation". Nature Genetics. 28 (3): 276–80. doi:10.1038/90123. PMID 11431700. Akrami SM, Winter RM, Brook JD, Armour JA (December 2001). "Detection of a large TBX5 deletion in a family with Holt-Oram syndrome". Journal of Medical Genetics. 38 (12): E44. doi:10.1136/jmg.38.12.e44. PMC 1734777. PMID 11748310. He ML, Chen Y, Peng Y, Jin D, Du D, Wu J, Lu P, Lin MC, Kung HF (September 2002). "Induction of apoptosis and inhibition of cell growth by developmental regulator hTBX5". Biochemical and Biophysical Research Communications. 297 (2): 185–92. doi:10.1016/S0006-291X(02)02142-3. PMID 12237100. Fan C, Liu M, Wang Q (March 2003). "Functional analysis of TBX5 missense mutations associated with Holt-Oram syndrome". The Journal of Biological Chemistry. 278 (10): 8780–5. doi:10.1074/jbc.M208120200. PMC 1579789. PMID 12499378. Garg V, Kathiriya IS, Barnes R, Schluterman MK, King IN, Butler CA, Rothrock CR, Eapen RS, Hirayama-Yamada K, Joo K, Matsuoka R, Cohen JC, Srivastava D (July 2003). "GATA4 mutations cause human congenital heart defects and reveal an interaction with TBX5". Nature. 424 (6947): 443–7. doi:10.1038/nature01827. PMID 12845333. Huang T, Lock JE, Marshall AC, Basson C, Seidman JG, Seidman CE (2003). "Causes of clinical diversity in human TBX5 mutations". Cold Spring Harbor Symposia on Quantitative Biology. 67: 115–20. doi:10.1101/sqb.2002.67.115. PMID 12858531. Collavoli A, Hatcher CJ, He J, Okin D, Deo R, Basson CT (October 2003). "TBX5 nuclear localization is mediated by dual cooperative intramolecular signals". Journal of Molecular and Cellular Cardiology. 35 (10): 1191–5. doi:10.1016/S0022-2828(03)00231-1. PMID 14519429.